Stephen Curry, No. 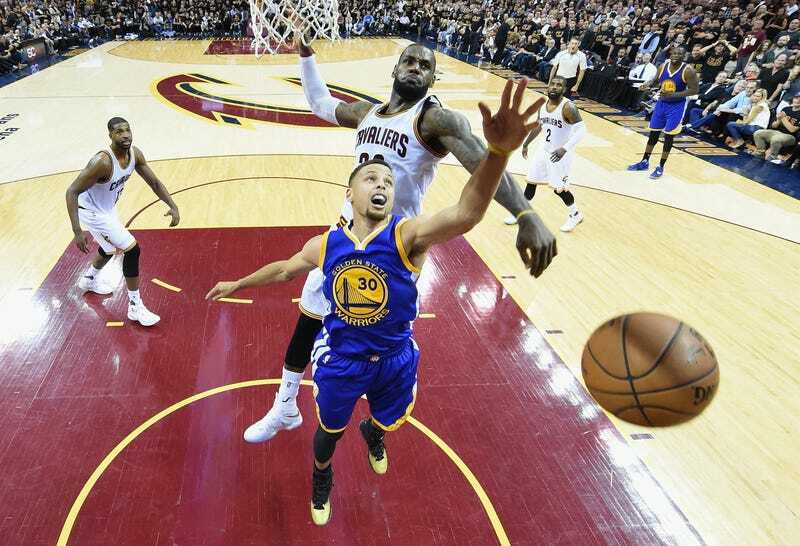 30 of the Golden State Warriors, has his shot blocked by LeBron James, No. 23 of the Cleveland Cavaliers, during the second half of Game 6 of the 2016 NBA Finals June 16, 2016, in Cleveland. The Cleveland Cavaliers took the win against the Golden State Warriors Thursday, becoming the third team ever to force a Game 7 after trailing behind with a 3-1 deficit in the NBA Finals, the Los Angeles Times reports. The stakes are higher than ever now for the 8 p.m. ET Sunday game that will be held at Golden State's Oracle Arena. As the Times notes, no team has ever come back from a 3-1 Finals deficit to win the championship. “It’s going to be the hardest thing we’ve ever done in our lives, but we’re ready for it,” the Cavs' Kyrie Irving said in an interview, the Times reports. Amid a heated Game 6, the Warriors' Stephen Curry was ejected for the first time ever after six fouls were called against him. In his upset, he threw his mouth guard, hitting a fan in the front row. According to the Times, it is likely that a fine from the NBA will follow. “I’ve thrown my mouthpiece before. I usually aim at the scorer’s table. I was off aim. … It was obviously frustrating fouling out," Curry, the league MVP, said of his display of temper. Warriors coach Steve Kerr may also face penalties after criticizing officials and saying that he "was happy" with Curry's reaction. Despite Game 7 now looming ahead, the Cavs' LeBron James remains optimistic.